The purpose of best practices is for managers to be able to improve the call center productivity and efficiencies. Call center improvements begin with the agents. By following best practices for each application the call center improvements will happen. The best practices will help you run an effective inbound, outbound or blended call center. This is an enewsletter copy of the Best Practices for Wallboards. Visit the Spectrum website or SlideShare for the full version. Wallboards can improve productivity and revenue if they are used properly. There are many ways to engage a wallboard (LCD Screen) in a call center today. In this Best Practices Paper (BP) we will talk about the top 5 methods of BP in the call center. Every call center has challenges or problems with agents, policies, practices, procedures, communications, training, knowledge etc. It is up to the manager to identify the problems and put in place applications that will reduce or eliminate the problems. Wallboards are used to communicate to agents, supervisors, mobile managers, senior executives and visitors. 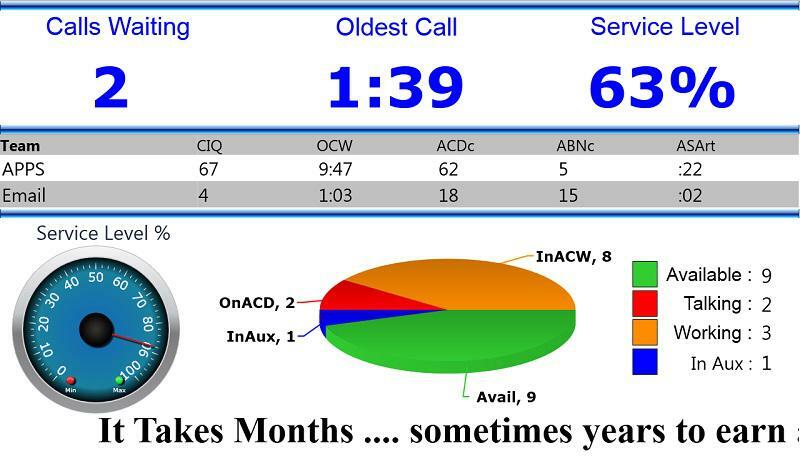 The content that is displayed on the wallboard can help reduce some of the challenges the contact center faces daily. Status notifications and alerts: Calls/emails/chats/tickets waiting, longest wait time, Abandon rates, service level and other internal data. Product and services information updates, reminders, introductions. Video, Live television, training DVD’s. There are many options to the content that can be displayed on the wallboard. The object is to understand the challenges the contact center is having today and determine what information will help reduce those problems. Who is the wallboard audience and will they be affected by the content on the wallboard? The content on the wallboard should be for the group that can and will see the wallboard. Displaying data for another group or for the manager will waste valuable time on the wallboard. Agent specific data or messages should not be shown if the content is negative. If an external audience will see the wallboards, be careful about the content that is displayed. Can the agents actually see the wallboard from their desk? Is the font large enough for them to see the data? Will changing the font enable others to see data they should not see? By knowing the audience that can visibly see the wallboard you are able to determine the content that should be displayed. You will also know what content that should not be displayed. Businesses have goals and targets they wish to achieve and surpass. Wallboards can be used to display these goals, targets and compare them against the actual numbers as well. The purpose for displaying the goals and targets is to remind agents what they should be working towards. Too often agents forget some of the other goals that are critical to the call center. Display the group level goals and targets and compare them against actual statistics for real time and historic. Display trends of actual versus goals. Do any of the goals and targets contradict best practices or company policies? Example: Total talk time should not exceed 65 – 70% per day. As a manager you are aware of the goals for the call center. You know the targets for all of the metrics, groups, agents, etc. However the agents are not aware of these things and need the reminder of what they should be trying to achieve on a daily basis. By displaying the goals, targets and actual status agents are aware of what they need to accomplish. Also take into consideration about how your goals and targets can change throughout the year, holiday seasons for example. The design layout of the wallboard needs careful considerations. What looks nice on a desktop monitor may not work on a wallboard. What data should appear as text or as a gauge? How much data can be displayed? How long should the data appear on the screen before switching over to other content? How long can my messages be? There are so many questions about content and what are the best practices for each metric. Too many KPI’s on the wallboard is confusing and not visible. Select the right gauge for the KPI. It has to be easy to understand immediately or it loses its value to the audience. The length of time a screen of data needs to appear is a minimum of 15 seconds. Less than that will not work. Messages should be short and concise. Do not worry about proper grammar get your point across to the audience. Thresholds should be easy to understand, colors, messages and sounds need to be appropriate for the audience. While designing your wallboard layout keep in mind your challenges, goals and audience. The layout should address each of these with the plan to improve productivity and efficiencies. There are many things to consider with the design layout: visibility distance, color blindness, how sounds affect people, time to read the content, spreadsheet confusion, KPI and gauges match up. Product and services are part of your business and agents need reminders of this. Managers often forget that agents are busy and do not have on going access to information about the products and services the business offers. Businesses will make changes and neglect to notify the agent who now has to handle the communications with the customer. Customer service representatives who are handling trouble tickets need to be aware of changes or reminders of services that are offered. Product and services information should be displayed and updated during seasonal business changes. Images of products, marketing notifications, and services when appropriate should be added content. Include messages about the products and services or as alerts to business changes. If your business offers products and services then the agents should be reminded on a regular basis. Do not wait until you see customer satisfaction dropping before you begin to display your business to the agents. Best practices vary for everyone so if some of the above information does not seem to fit your business then ignore it and work with the information that helps your contact center. The goal for best practices is to help the business improve productivity and reduce costs.